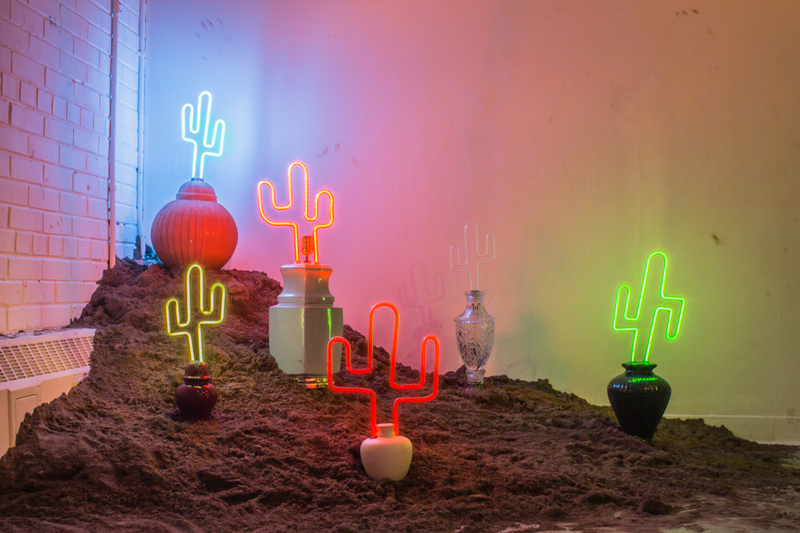 Ode to a wild cactus lamp. 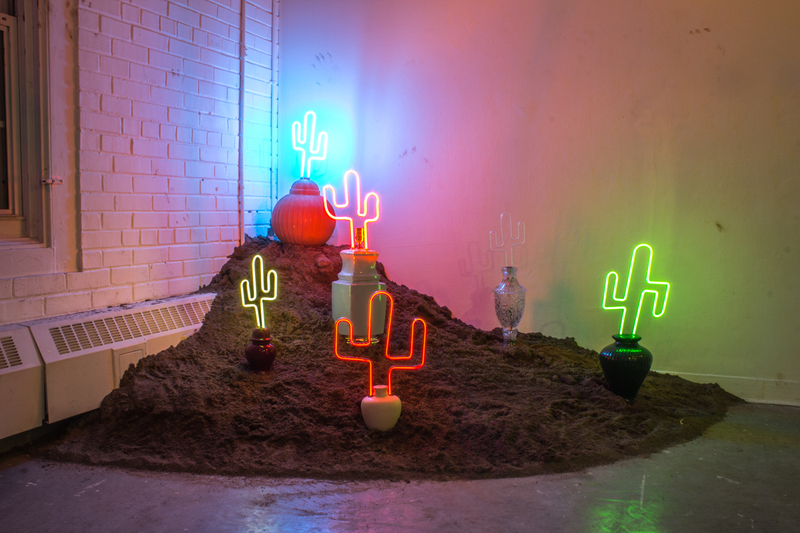 For my final research/ exploration project in glass and light I chose to explore cactus lamps. 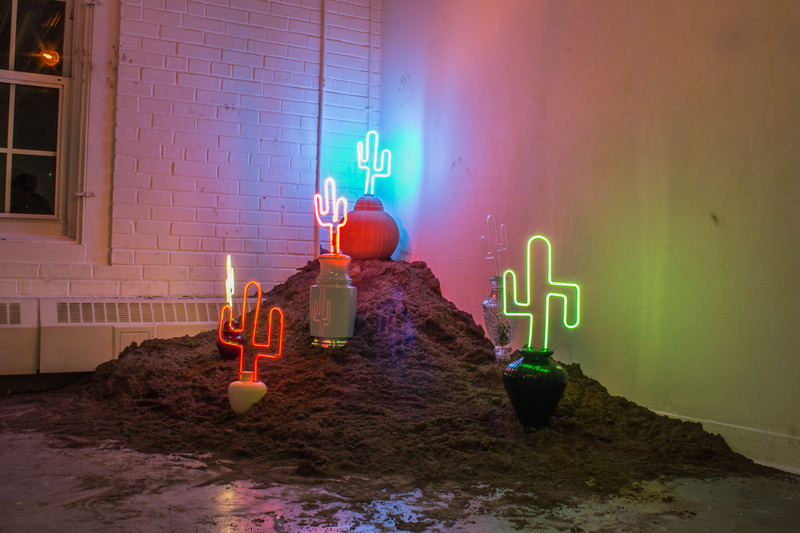 Traditionally a solitary creature, I was interested in the many ways the cactus lamp can talk about value, cliche, re purposing, mass production, nature, and humor. Through my exploration into neon and the art/industrial sides of the medium I have become increasingly interested in the value of neon. 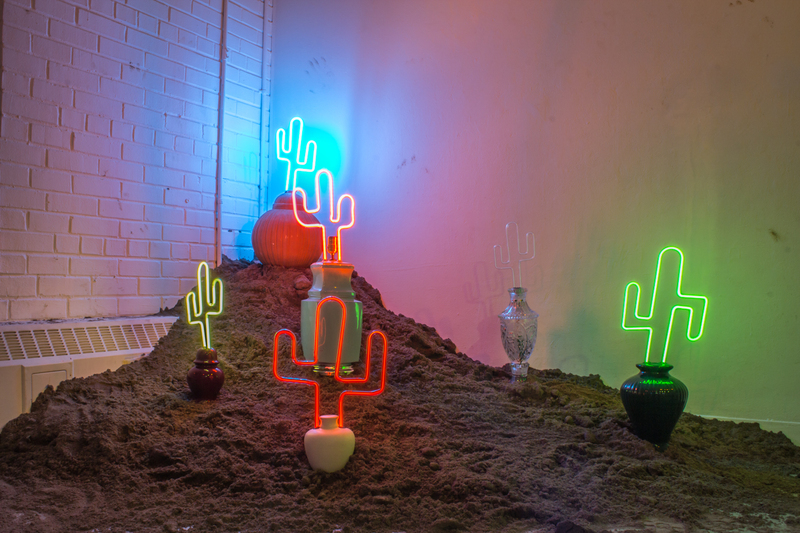 Mass produced neon items, such as cactus’s flood the neon market at relatively low price points that offer little insight into the effort and skill required to produce these objects. Neon is such an incredibly natural art form, other than the fact that you need gas extraction equipment to harvest these gasses, expensive flame working equipment to bend mass produced glass tubes, and complicated electrical equipment to bombard and fill these tubes. Cactus’s are natural too, right? What do these two natures say about each other? I dont really know, but its interesting isn’t it? By installing these “natural” forms in the mass produced lamp bases of the Salvation Army I have created a juxtaposition between these two worlds while still maintaining the unsettling feeling of machine made industrial non natural lamps. Lastly I chose to display these lamps in their natural habitat, the desert. It seemed only fitting to return them to their home to live out the rest of their short cactus lives together. 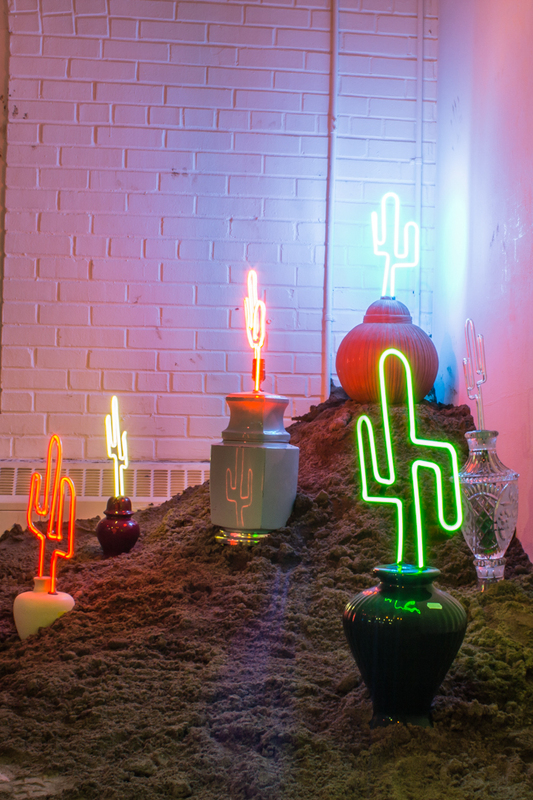 Is the neon cactus a great prolific statement about the state of man in the world around him, or is it simply an attempt to domesticate a piece of nature in ones living room? C0; Diet Coke is an exploration into the way products are sold. Through the use of neon this piece illuminates soda cans and bottles to cast light on this over marketed and multi billion dollar industry. whether or not you like it, these products are an integral part of every day life. Taking this comment even further, the vending machine is located in the living room of a house and is completely unavoidable to the inhabitants. While discussing this work my classmates took note of the “candy like colors” which reminded them of childhood. The use of a vending machine also brought up nostalgic memories for some them of their childhoods. While the cut out shapes in the cans went over well, some were left wondering if the bottles really worked well with the cans or if they were out of place. They also wondered about the specific choices of beverages and if they did or could have more/additional meaning. Someone else brought up the price of the drinks, at a quarter there is hardly any capitalism going on here at all. What does that say about the work? Lastly they commented on the location of the machine and wondered how a change of venue may alter the piece. This episode of Kielz kichten is brought to you by the letter “gelatin.” Please purchase their product. Subscribe if you like the cooking show things, and tell your friends. Facebook is also a thing, so do that. The more views this great instructional video gets the more of a big head we will get; thus meaning more awesome shows for your viewing face. please also enjoy our cast photo from the after party. You can see us all enjoying a yummy slice of yummy cake! You may remember this image, It was posted some time ago to this very information transmission station. It was of a simple yet humble Mallow Peep. Today my loving parents purchase Adobe Photoshop CC for me. Before I went to be i could not help but mess around with it just a bit. 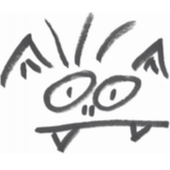 After seeing a button that i could not quite understand I clicked and ART HAPPENED… All by itself! Thanks Adobe, and enjoy. There are no words that could ever describe the atmosphere in the room during is moments event; But ill try. It all began when we found a loaf of bread on top of our cabinets in the kitchen. It was the least expensive bread money could buy, and had been sitting there since the end of October. Kyle wanted bread pudding. After inspecting the bread he found there to be no mold and determined it to be consumable. Only then did we realize bread was the only of many ingredients that we would need that we actually had. The following video depicts the true events that followed. After watching, for only the small contribution of $12.43 you can help khylz kishin afford the necessary ingredients to create an actual bread puddin’. Watch, be happy, eat more puddin’. I present to you, my trusted internet following, The Amazing Chop-A-Majigger. This high tech and extremely sophisticated kitchen implement, whose use is unsurpassed by any other device, is truely the best device for any job. For only one easy square payment of $19.95 you can take home your very own Chop-A-Magijjer today! CALL NOW! Dont forget to ask how to get a free BERT with your purchase. For more information please review or informational video.